Look in your sock drawer for something white. Go to a place where you’ll see the time. So your child would then go looking at the clocks around the house looking for the next clue. At the end of the treasure hunt, the child would find a “pot of gold” treasure like a selection of rainbow-themed treats or chocolate gold coins. 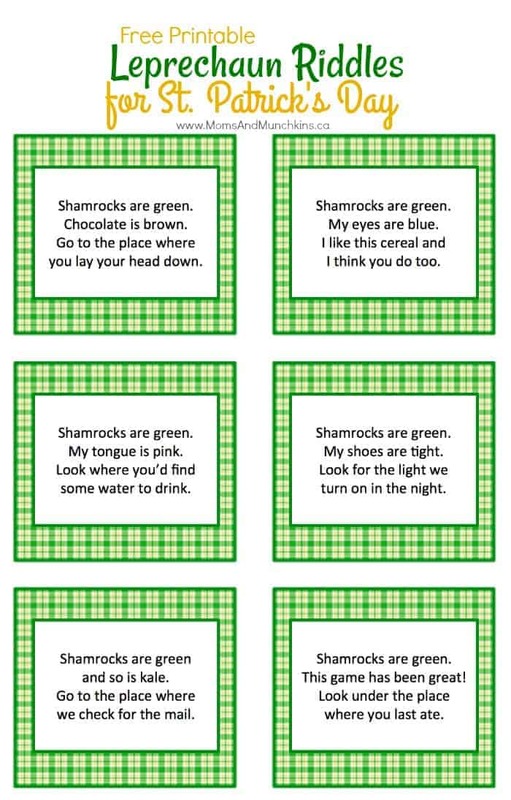 So to start with, you’ll need this free printable Leprechaun Riddles sheet full of 12 clues for you to hide around the house. The first clue could be hidden in a place where your child will spot it in the morning (like on the breakfast table or the bathroom mirror). Go to the place that keeps milk cold. Hide the next clue in the fridge. Look in your sock drawer for something white. Hide the next clue inside a white sock in the closet. Go to the place where you lay your head down. Hide the next clue under a pillow or inside a pillowcase. I like this cereal and I think you do too. Hide the next clue on a box of Lucky Charms cereal, or any other cereal in your pantry. Go to where you’ll find your bag to pack. Hide the next clue by your child’s school backpack or suitcase. Could my treasure be under your bed? Hide the next clue under your child’s bed. Look where you’d find some water to drink. Hide the next clue on a water cooler, by the kitchen sink, or in the fridge on a water bottle. Look for the light we turn on in the night. Hide the next clue on a nightlight, lamp or light switch. Go to a place where you’ll see the time. Hide the next clue on a clock. Go to the place where you’d make a phone call. Hide the next clue on a phone. Go to the place where we check for the mail. Hide the next clue in your mailbox or on the computer screen (email). Look under the place where you last ate. The treasure (or next clue) could be hidden underneath the kitchen table. For more fun ideas, visit our St. Patrick’s Day page. We have more free printables, DIY games, treat ideas and more! We’re always adding new ideas and we’d love to share them with you! You can follow along on Facebook, Twitter, Pinterest, and Instagram. I love the rhymes and another fun activity that I think kids would love. The rhymes and limericks are great for helping with early literacy! Wonderful ideas here. That is a great idea! Our babies are too young for that one right now, but I will keep it in mind for the future. I have enjoyed your site and all of the creative projects. It is under the Family Blogs section. Thank you! I’ll check it out today!